Most of todays video cameras are able to shoot high resolution stills just as many newer still cameras can shoot high quality video. With the Pclix XT hundreds of different video cameras can be triggered to shoot time-lapse sequences or to start and stop recording video. 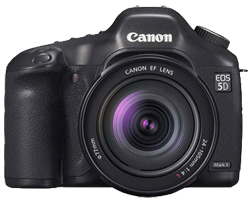 You can easily shoot stills at regular intervals or video clips at whatever length and interval you choose. Amazing! Click Here to learn more. The original Pclix LT was always been able to trigger dozens of different digital still cameras. 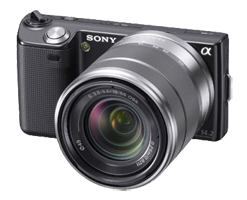 Now with the Pclix XT we've added even more, including the Sony NEX-5, NEX-5N and NEX-7. Plus cameras from Nikon, Canon, Olympus, Panasonic, Sony, Pentax and others are compatible with the Pclix XT. Click Here to see if your digital still camera is one of them. 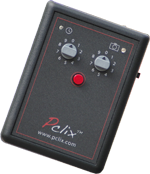 With the Pclix XT you can remotely start and stop your Canon 5DMkII, 7D, 60D, T2i or T3i recording video. Plus with our C-150 Extendible Infrared Cable your camera can be triggered up to 200 feet away using standard BNC video cable. Click here to see how the Pclix XT gives you remote recording control plus extremely flexible time-lapse shooting with your Canon 5DMkII, 7D, 60D, T2i or T3i camera. The Pclix XT is a great addition to any Cinematographers toolkit. If you own our original Pclix LT then the newest Pclix XT is a Good News, Great News story for you. Why? Because every Pclix LT sold since day one can easily be upgraded with our Pclix LT/XT Upgrade Kit. Our Upgrade Kit turbo charges your Pclix LT giving you the exact same features and camera control found in the Pclix XT. Video Camera support, Canon 5DMKII, 7D, 60D, T2i and T3i remote recording control plus a whole lot more. Incredible! Click here for more information. "What a great little product. Thanks so much." We'd love to hear your suggestions, comments or feedback regarding our products or this website. The Pclix XT, it's a beautiful thing! The affordable, portable, camera triggering solution. If you have the desire to easily photograph time-lapse sequences or the need for controlling video recording using digital still cameras or digital video cameras then the Pclix XT is for you. Not only is it easy to use and program, the Pclix XT is compatible with a long list of Digital Still Cameras* and Digital Video Cameras* including amazing recording control for cinematographers using Canon 5D MkII, 7D, 60D, T2i and T3i DSLRs on set. Pclix products are being used by thousands and thousands of photographers and film makers all over the world. Many in some of the most challenging and remote corners of the planet. People are choosing our products over the competition because they are well designed, simple to use and extremely durable. The Pclix XT fits in the palm of your hand as easily as it fits into just about any camera bag. This little beauty is built to last and is fully supported with outstanding customer support. With the Pclix XT you can trigger to your camera every second or every hundred hours plus anywhere in between in one second increments. Using the Split Second Mode you can even trigger your camera in tenths of a second, giving you greater flexibilty when using shorter intervals. The Pclix XT has 99 interval settings directly at your fingertips. Ten of which can be programmed by you to any duration you choose up to 100 hours. As well the Pclix XT you can program how many images will be taken using the Image Count Option. There's a Start Delay Option plus the shutter can be held open for up to one hour using the Bulb Option. 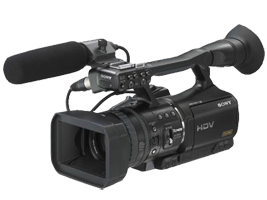 If you are using a Digital Video Camera triggers can also be sent to start and stop your camera recording video clips, record only one clip or as many as you like at regular intervals. The length of your video clip can be up to 1 hour in length if you are interval shooting. Programming the Pclix XT is straight forward and extremely easy, user preferences are stored in flash memory forever or until modified by you when needed. 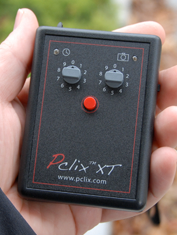 Click Here to learn more about the Pclix XT and what this amazing little device can do for you. * Check our Camera Compatibility Menu on the upper left of most pages including this one. There you will find information about how the Pclix XT triggers many different cameras, you can check if your digital still or digital video camera is supported by the Pclix XT. Plus you can learn the basics about shooting time-lapse movies from start to finish using a digital still or video camera. Quicktime from Apple is required to view most of the movie files on this website. Every two months or so our Pclix newsletter rolls off the digital presses. It's focus is time-lapse tips, tricks, examples and demo videos. Interested? Add www.pclix.com to your favorite Social Networking websites. All content and video clips on this website are protected under copyright by either 1017 Visual Effects Inc. or the contributing artists. Please respect this. Copyright Â© 2012 - 1017 Visual Effects Inc.